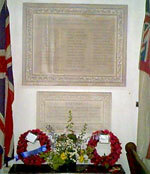 The memorial is sited in the Parish Church of Lechlade, Gloucestershire, UK. The Parish Church is situated in the centre of the town. IN GRATEFUL MEMORY OF THE MEN OF LECHLADE WHO GAVE THEIR LIVES FOR THEIR COUNTRY.